The Microsoft Type Cover for the Surface Pro series of tablets is excellent—the Touch Cover, less so. But the latter is the example Logitech has followed with the new Keys-to-Go rugged fabric keyboard for the Apple iPad. Viewed at an angle, the two keyboards from Microsoft and Logitech look surprisingly similar, aside from their scale—the iPad is smaller than the Surface. The Keys-to-Go measures 9.53 inches wide, 5.39 inches deep, and 0.24 inches high. That’s about 13 percent smaller across than the Type Cover, and 26 percent shorter, from the top of the keyboard to the bottom. But unlike a Type Cover—or one of Apple’s Smart Covers—the Keys-to-Go doesn’t appear to be an integral part of the iPad. 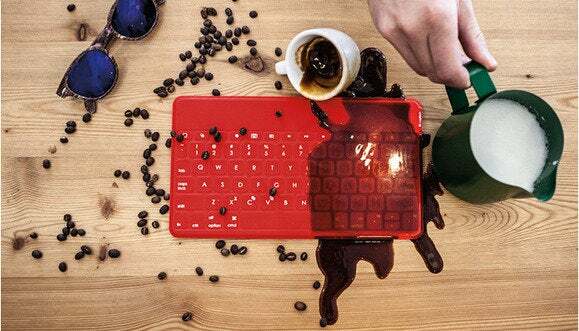 Photos published by Logitech show the keyboard simply being toted around, and not protecting the keyboard. The Keys-To-Go looks a little small to type on comfortably, too. 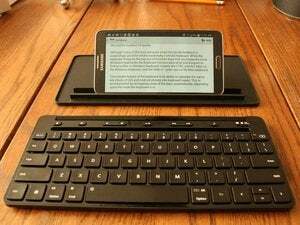 However, you can see how it carves out a bit of a niche for those who dislike typing on the glass of the iPad, but don’t want a more full-fledged keyboard for the road. One of the key selling points is that the Keys-to-Go keyboard is completely sealed in what Logitech calls FabricSkin, meaning you’ll be able to spill coffee or donut crumbs but keep on clicking. Another is that Keys-to-Go boasts a fully mechanical keyboard inside, implying that users should have a decent typing experience. Logitech’s Keys-to-Go is designed to be carried. For something more specifically designed for the iPad, Logitech also announced the Type+, an all-in-one keyboard protective case for the iPad Air 2. It has a an automatic on-off feature which turns the keyboard on when upright and off when laid flat. If you want something a bit less rugged, Logitech also has the new Ultrathin magnetic clip-on keyboard cover, with its own two-year battery life. The Keys-to-Go costs $69.99 and is available in black, red, and teal. The $99.99 Type+ is available in black, dark blue, bright red, bright green, electric blue or violet. Finally, the Ultrathin costs $89.99 and is available in space gray and silver. Why this matters: If you’re looking for a stylish, comfortable, rugged keyboard, Logitech’s Keys-to-Go may be for you. Yes, you may receive a few smirks from Microsoft fanboys who notice the Microsoft-y look and feel of your keyboard. Ignore them. Aren’t we over that, already?